Studying for the CPA exam requires a major a commitment. Just meeting the requirements to take the CPA exam aren’t easy, as you’re required to meet 150 credit hours of education which typically requires some graduate level classes. But the rewards for earning your CPA can be worth it in the long run. BLS data reports a median salary of $83,000 for accountants and auditors based on 2017 data. So before you invest your time and money into an expensive CPA study program, its important to understand if your really ready to jump into the challenge. We’ve compiled a comprehensive list of the best free CPA exam study materials. The resources below will help you fully understand what to expect before signing up to take the CPA exam and help you decide if its the right path for you. 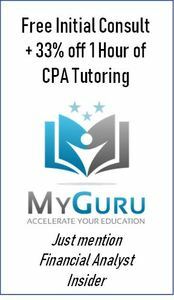 Click image for free initial consult & 33% discount on CPA tutoring from My Guru. Webinar: How to pass the CPA Exam in 6 months. You’ve made it through 150 credit hours of accounting and you’re ready to start preparing for the first of 4 exams. It would probably be a good idea to take a baseline assessment of what your skills are today. That way you can tailor your study efforts to maximize your time by focusing on improving your weaker areas. 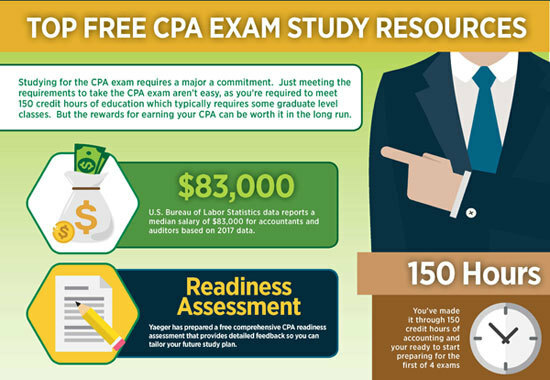 Yaeger has prepared a free comprehensive CPA readiness assessment that provides detailed feedback so you can tailor your future study plan. The best part is that this assessment is FREE! When I’m studying for a big test, the single most useful tool for retaining formulas and concepts is flash cards. Ideally flashcards would be available in a mobile format so you could review the material anytime you had a few free minutes on your commute or during your lunch break. Surgent has created the ideal solution for you. They have created a comprehensive CPA flashcard app for both IOS and android that is available on your phone or tablet. The app includes over 2,200 questions and covers all 4 parts of the CPA exam. Amazingly, the app is completely free to download. Click here for the FREE Flashcard App! If you’ve made the decision to pursue the CPA, then you’re probably already considering whether it makes sense for you use a prep course as part of your study plan. The key benefit of a good CPA prep course is the ability to master the material by regularly taking practice questions that include clear answer explanations. The best prep courses offer detailed analytical data to help you focus your studying on your weakest areas. The challenge can be sorting through the different options and price points. We created a detailed comparison of the best CPA exam prep courses to help you compare the prices and features. But there really isn’t anything quite as effective as trying out the platform for yourself. By going through the video tutorials and reviewing the practice question formats, you can make a much better decision if a particular prep course is right for you. Free 3 day trial of Surgent CPA Review! In order to be fully licensed as a CPA, you need to meet the requirements of the state accounting board in the particular state you would like to practice. The National Association of State Boards of Accountancy offers updated information about the requirements for all 50 states. Try not to be too intimidated by the 2018 pass rates. AICPA data shows that less than 50% of people passed the AUD, FAR, and REG exams. Students did slightly better on the BEC exam with a 56% pass rate. That information begs the question of how the CPA exam is actually scored.